Collingwood seemingly had an endless supply of South Australian hopefuls willing to try their luck in black and white throughout the 1980s. Some came with big reputations on lucrative deals as well as huge transfer fees; others preferred a more low-profile approach. Some succeeded; others were less than enduring. A few stuck around for a period before returning home, as was the case with close-checking, moustachioed defender Tony Burgess, who played 21 games across two seasons in the No.20 jumper. Burgess is remembered as a dependable, dour defender rather than a dynamic one, though his long kicking was a stand-out feature. Tall, rangy and quick out of defence, he enjoyed a fine career with West Adelaide in the SANFL before and after his relatively brief experiment with VFL football ended at age 25. He had trained with Collingwood before officially joining the club, as he worked for a time in Melbourne, yet still played for West Adelaide (who consistently refused to clear him). They ultimately relented, and the already established backman got the chance to play in the big league. Burgess grew up in the small Flinders Ranges township of Quorn, in South Australia, which was the birthplace of legendary SANFL football identity ‘Fos’ Williams, father of Mark Williams. His own father was a publican in one of the town’s four pubs in the town of 3000 residents. Burgess was residentially zoned to North Adelaide, but wanted to join West Adelaide because of the connections with the Williams family (Fos was coaching Westies at the time). He was eventually cleared and made his debut in 1980 as a 19-year-old. In 1983 and ’84, Burgess actually worked in Melbourne – he was a sales representative with Unifood Services – and trained with a few different VFL clubs at times, before flying back to Adelaide on the weekend to play for his SANFL team. West Adelaide wouldn’t allow him to play in Melbourne, so he became a fly-in, fly-out player for the best part of two seasons. He trained at times with Sydney’s Melbourne-based players, but also for a time from August 1983, with Collingwood at Victoria Park. He played a key role in West Adelaide’s 1983 premiership side, restricting star Sturt player Rick Davies to just two goals. By the following Monday, Burgess was back at work in Melbourne, while his West Adelaide teammates partied hard. He was eager to try his luck in the VFL – and at Collingwood – but again West Adelaide wouldn’t provide him with a clearance. He was forced to cool his heels for a further year in 1984 before being cleared. 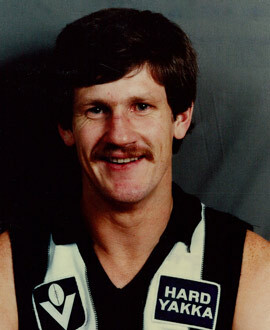 Unlike many other transfers during Collingwood’s often reckless recruiting drives in the early to mid-1980s, Burgess didn’t excessively cost the club. In fact, they made a reasonable profit on the deal. Part of the transfer meant that Dale Woodhall and Ron Andrews moved to West Adelaide, while Derek Shaw was also leased to the SANFL club. Burgess’ first of his 21 VFL games in black and white came in a noteworthy game – the first Friday night match in Melbourne – when Collingwood took on North Melbourne at the MCG on an evening when ground officials underestimated the crowd that quite literally burst through one of the gates. More than 65,000 fans attended, and he had 14 disposals, kicking a behind in the Magpies’ 38-point win. He settled in quickly at Collingwood, being regarded as easy-going and good natured. He played nine of the first 10 games that season, mostly as a quick defender with the ability to kick with both feet. He was skilled, balanced and composed, and Magpie officials were extremely happy with his start. But then he suffered a serious neck injury which sapped the strength from his right arm and he missed the rest of 1985. The 1986 season was a challenging one for Collingwood on many fronts. Bob Rose quit as coach and handed over the reins to Leigh Matthews, while the club went to the brink of bankruptcy, asking the players to accept a 20 per cent pay cut. A few players refused, but Burgess accepted the reduction. He ended up playing 12 games in what proved to be his final season at Victoria Park. Injuries again hit at a key time, and he spent much of the latter part of the year in the reserves. All VFL clubs had to nominate three players to go to the fledgling Brisbane Bears, with Collingwood offering up Burgess’ name. But he had no intention of going north, and was happy to return home to his home state, where he rejoined West Adelaide. His time with Collingwood was over – at 25 – but not his time in football. He went on to play seven more seasons in the SANFL, finishing up with 185 games with West Adelaide to go with his 21 for the Magpies. He made an impact as a coach, too, though not in the way he would have anticipated. He coached West Adelaide under 19s to a flag in 2002 in the most trying of circumstances. During that year, Jake Watson, the son of Burgess’s 1983 premiership-winning teammate Larry Watson (and the nephew of Tim and cousin of Jobe) collapsed and died on the field during a match. What Burgess did in uniting that grieving young playing group – in many ways – might have been every bit as important as the many achievements he made on the football field.